At 06.45am I leave the hostel and hike along the big street of Kenmare to the starting point of today’s excitement, using the Kerry Way. The knee still hurts but thanks to my slow pace the pain becomes more a local pain in stead of a pain that paralises the entire joint. The weather is great again, do they ever have other types of weather than blue skies in Ireland? 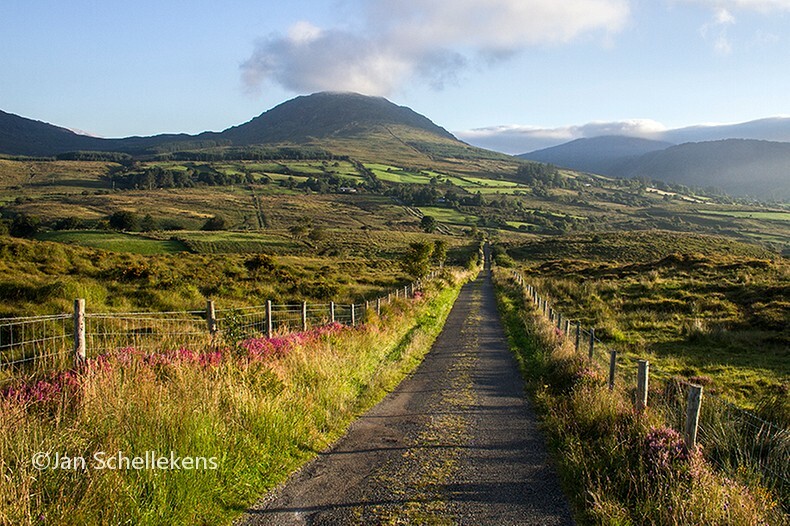 The trail goes straight north up the hill, leaving Kenmare, crossing fields with great views along a local road. The section where the road crosses the hill shoulder, illusively named Windy Hole, is lovely and pleasant to cross on this bright Sunday morning. Descending in the valley behind Windy Hole the field road leads along some small sections that tend to be marshy but I have had a lot worse in the past stages. After some horizontal kilometers, just after passing the announcement of the Killarney National Park, the trail goes up the hill to the northeast. The hill is drenched with marshy sections but, unlike the Beara Way, these are covered with comfortable boards. 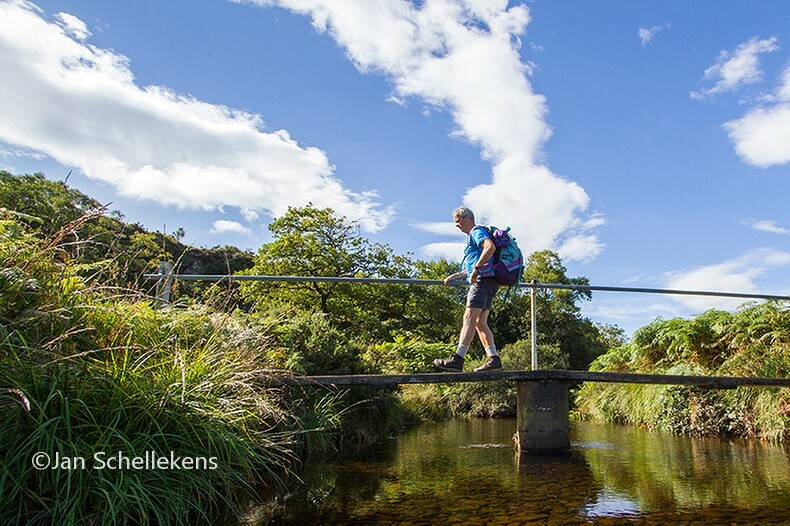 Altogether these boards cover more than one kilometer, and they enable hikers to maintain a decent pace, keep dry feet and enjoy the surroundings in stead of focussing on their feet. Going down the hill, I bump into the first fellow hikers/walkers of today. On the small sections of the trail in this valley hikers have to make way for hikers from the other direction. The biggest group that I had to step aside for included 30 people. 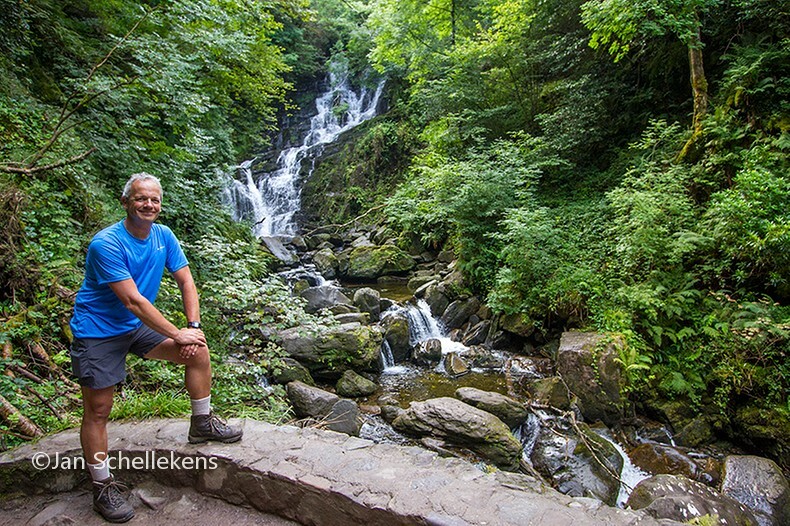 The final kilometers in the National Park are using a field road, which leads to the area with the famous Torc Waterfall. It is really crowded over here, the parking lots are completely filled. The waterfall turns out to be a lovely sight and I stop for the inevitable pictures. After crossing the national road the trail leads further in the direction of city of Killarney. At Muckross Park I leave the Kerry Way and go east, crossing the park to the main road. 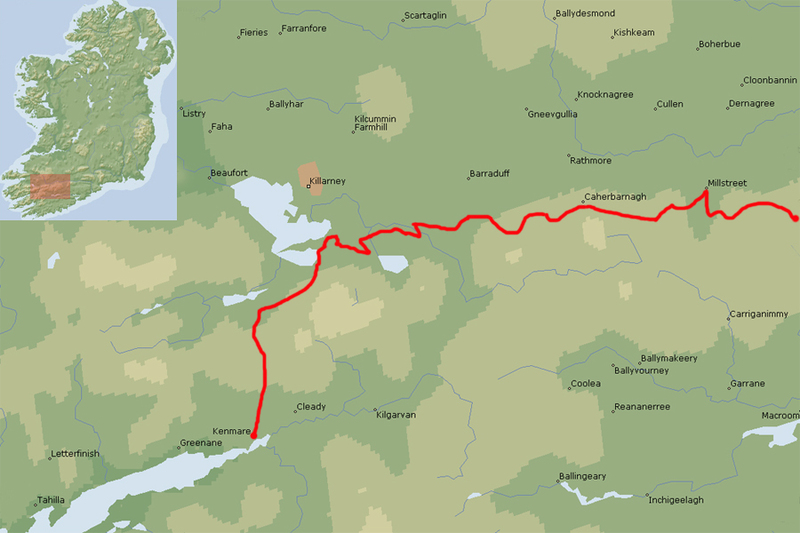 The next twenty-some kilometers or unmarked and lead from the Kerry Way to the starting point of the Duhallow Way, where the E8 continues. Since it is not signed or mapped I have planned my own directions. With the priority on safety I have chosen local roads that avoid as much as possible fast driving traffic (details are at the bottom of this post). However, I have to pass a short section of the N22. 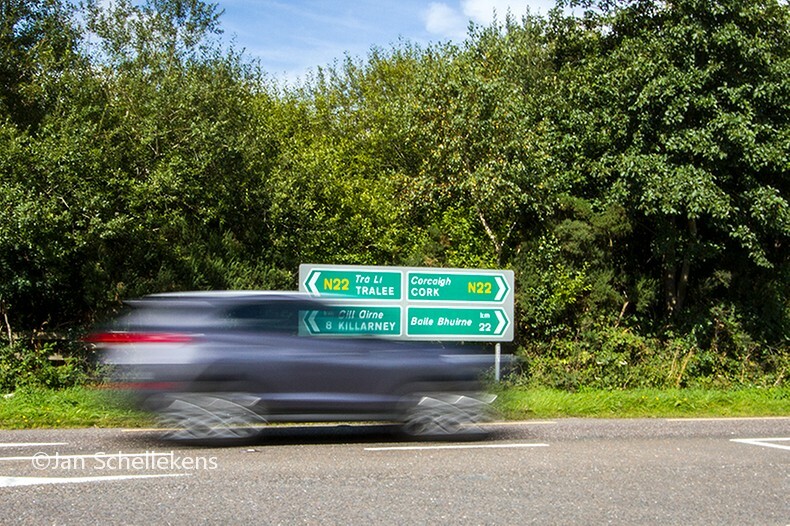 The N22 motorway is used by many drivers who believe that the maximum speed is a bare minimum for them to get to their destination. For every car that I hear approacing (from the front and from the back) I step aside on the side of the road and stand still untill the car(s) have passed. Fortunately the N22-section is short and I continue my way on the silent loacl roads in rural Ireland on a sunny Sunday afternoon. Arriving after 37 kilometers in the small village of Headfort (one bar) I hoped to find a B&B or anything of the kind, but the people that I meet, in the bar, know for sure that there is no lodging facility along the trail in the next kilometers. It is 16.45, the weather is still great and I feel okay, I have hardly any problem in the knee as long as I don’t stop for more than five minutes. I decide to continue my way to the starting point of the Duhallow Way, in the tiny village of Shrone. In the next couple of hours I take it easy while hiking southeastbound, I drink a lot and have my bottle refilled by friendly people that I meet along the way, At 19.30 I arrive in Shrone, 46 kilometers from this mornings starting point. 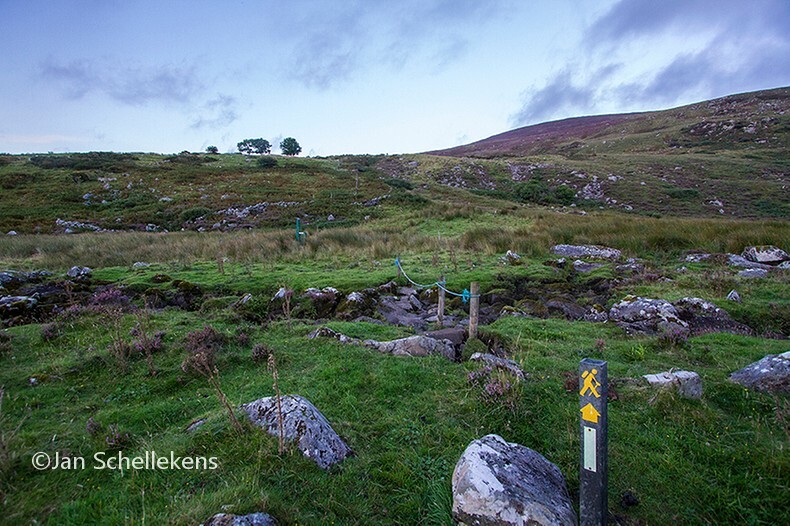 I take a short break, get informed by a the owner of the fields that I will be crossing about the direction of the signs in the beginning of the Duhallow Way and I use the inevitable steps to cross the fence. There is no break for me! The first few hundred meters through the fields, walking from one sign pole to the next, are very, very marshy and I am glad I am wearing my rubber croqs. After crossing a north-south field road the trail goes up the hill. The day has come to an end and the surroundings are preparing for the night. Even during the twilight and afterwards I can follow the signs easily with my Petzl (the signs also have a reflector on each side) but the terrain gets worse: there is no path or trail there are just signs that indicate the direction, leading through very wet sections, with holes and mud. Where the signs cross two parallel fences the sign indicates the wrong direction and I decide to follow the last sign and to continue my way down the hill to the local road, which I will follow and where the E8 bumps into in a few kilometers. The extra kilometers that I cover this way are to be preferred over taking the chance of slipping and sliding or falling in the rough terrain where the trail leads through. After reaching the local road I am still full of adrenaline and I continue my way eastbound. After two kilometers or so the E8 signs join me again on this road. This local road is very quiet, the quality of its surface is superb and it goes more or less straight east in the direction of the village of Millstreet. At a tiny crossing called Croonig’s Cross Roads, the signs go right up the hill. 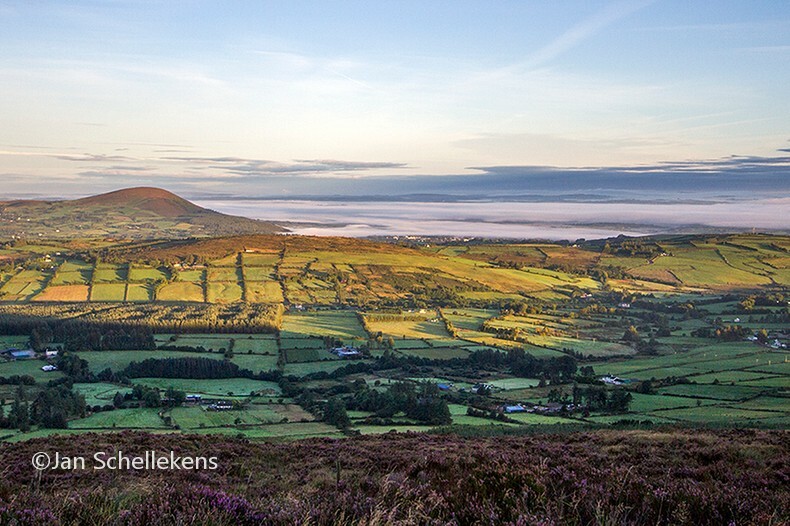 Shortly after they leave the road and lead through the terrain over the hill to Millstreet. The first 50 meters of this section look extremely muddy and I decide to keep my legs and feet safe by following the road, around the hill. Again: more kilometers than the signs indicate but safer to get to my destination in one piece. In the long descent down the hill towards Millstreet I pass many farms where dogs and cows start making noise when I pass. Just before the outskirts of Millstreet the E8 signs join me again. At the beginning of Millstreet (one hotel, two B&B’s, several restaurants and snackbars, many shops), where I arrive at 01.35, the trail goes straight south on another local road, gently up a hill. I continue my way without delay but I feel that my pace is suffering from fatigue. 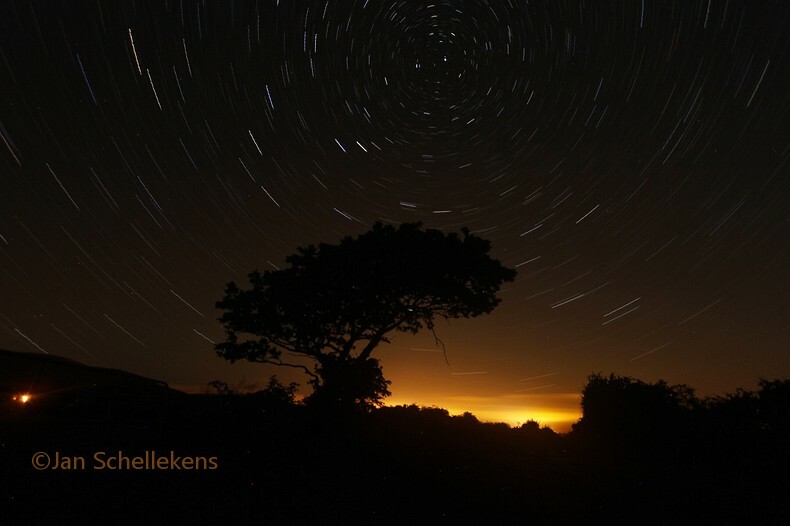 Halfway up the hill I find a great spot for a startrail picture, and this gives me a nice excuse for a 30 minute break. After the pictures have been taken I collect my lugage and continue my way slowly along the local roads. Just before Sunrise, at 06.00, I arrive at the foot of the hill Musheramore. I take a powernap of fifteen minutes after which the daylight is enough to continue my way along the signs through the field. In the first kilometer there are many muddy sections that are difficult to avoid, but I manage. After this the forrest road leads to a sort of terrace path where the view to the north gets more and more impressive with every step I take. Hiking at 500 meters altitude gives a magnificent view over the lowlands in the north on yet another bright and Sunny day. After a breakfast break enjoying the view I continue to the east, where the signs lead into the local road that goes from Millstreet to the southeast. I follow the road down the hill in a steady pace but I am exhausted after being on the trail for more than 24 hours. Where the trail leaves the local road to go left/north onto a field road that leads up the hill Carrigagulla I decide to call it a day and I finish my hike for this trip. Hitchhiking I get easily to Millstreet where I stay in the local hotel. A fantastic day (two days!) have come to an end. Dit bericht werd geplaatst in 1 - Ireland en getagged met B-rating. Maak dit favoriet permalink.